Be it mobile technology or notebooks, companies round the world seem to be focusing on the audio and video features of the gadgets. Recently we witnessed a growing trend amongst the high-tech notebook manufacturers bringing in support for the audio and video by venturing with professional firms to bring the most out of the newly designed trend setter. Just yesterday, we reported of Dell unveiling the XPS Notebooks which now feature the first ever ”Skype Certified” web cam as well as emphasis laid on audio by integrating the JBL Speakers. Today, we spotted a smartly designed Android phone known as the Lumigon T1, which has aimed at the media fans by featuring HD Video, a 5 megapixel camera, FM transmitter as well as the super-audio support from Bang & Olufsen. There used to be a time when phones were dressed with crystals, gold and Swarovski’s but now, the first thing which is looked into is the OS and if it possess a support from a tech giant, like Carl Ziess Lens etc. The Danish smartphone manufacturer, Lumigon unveiled its first ever smartphone and that too powered by the Android OS, delivering high-quality media experience. The smartphone further features a 5 megapixel camera, a 3.5-inch touchscreen display with a screen resolution of 800 x 480 pixels, integrated FM transmitter for pushing tunes to vehicle audio systems, and a built-in sound system powered by the high-end entertainment gear maker ‘Bang & Olufsen’. Furthermore, the T1 features a 800 MHz Freescale processor, GPS, Bluetooth, HSDPA connectivity and a HDMI Output. T1 is built on Scandinavian craftsmanship and design, coupled with the finest materials such as steel, aluminum, and scratch-free glass. These uniquely designed phones are also packed with features not seen in mobile phones earlier. 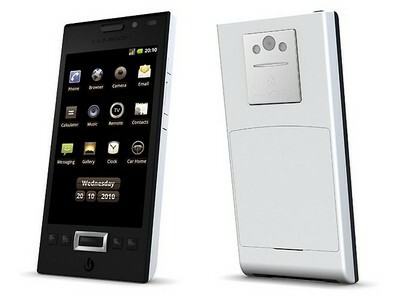 The Lumigon T1 would be available in the market during the second quarter of 2010 at an attractive price of 500 Euros before taxes and subsidies.